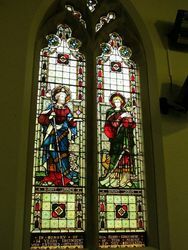 A stained glass window, featuring Saint James and Saint John, erected in memory of Reverend Henry Tingcombe, rector of the church from 1859 to 1872. THE REV. HENRY TINGCOMBE, FORMERLY OF ARMIDALE. (From the Australian Churchman.) 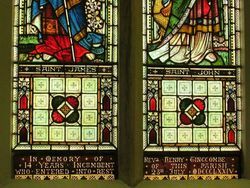 In our last issue, we noticed the death of this estimable clergyman, and we feel sure our readers will be glad to have a sketch of a life which was indeed an example to the flock. Born in Devonshire in the year 1810, Mr. Tingcombe arrived in the colony while still a very young man, and engaged, we believe, in squatting pursuits in the district of Monaro. At this time the pastoral interest was at a low ebb, and many will remember the heavy losses of many of the squatters of that day. Mr. Tingcombe was not long afterwards employed in the Civil Service of New South Wales, and so remained for some years, when he determined to enter the Ministry, and was ordained by Bishop Broughton on the 9th March, 1846, to the cure of St. Peter's, Armidale, New England, which cure he held for a period of nearly nine years. For some years this work was performed by him, until at length a neglected cold settled upon his chest, and his life hence forward was one of weakness and suffering ; he struggled on for a time, but was at last obliged to leave his charge, as it was then thought, to die. 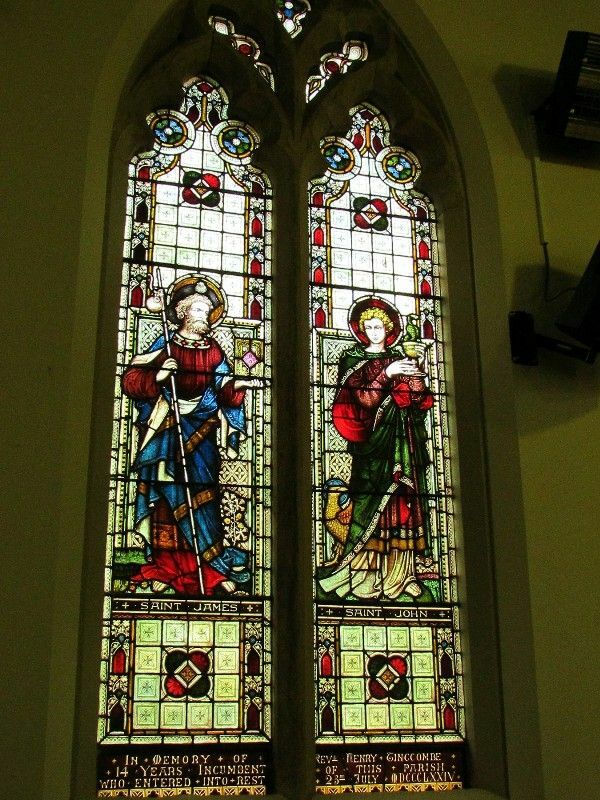 However, his Master had still work for him to do, and a witness to bear, and his health having somewhat improved, he was appointed to assist the Incumbent of All Saints', Bathurst, and afterwards held the cure of Carcoar. When Sir William Macarthur and his family partially endowed the parish of Camden, and thus gained the first presentation, the Rev. Henry Tingcombe was the clergyman chosen to the incumbency, and there the remainder of his ministerial life was passed. His work at Camden was necessarily quieter and less energetic than his earlier ministry in New England, for to the end of life he suffered from the effects of that hard and self-denying labour, so entirely beyond his strength, but he lived to see the district, in which he had been the solitary pioneer, occupied for Christ by a Bishop and six clergymen, and we know well how his heart rejoiced over this increase of labourers in the vineyard of his Lord. A work in which he took much interest, and which he did much to advance, the enlargement of the Chancel of his Church at Camden, he was not permitted to see the commencement of; but that work will ere long be completed, and we hear with sincere pleasure, that it is proposed to erect a memorial tablet to him within its walls.